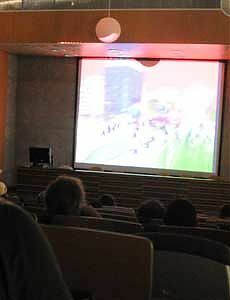 Retrospective screenings of all videos 2006-2009. In collaboration with the Department of Multimedia and Graphic Arts of the Cyprus University of Technology. Giorgos Sisamos, Dinos Hatdjidemetri, Yiannis Yiapanis, Helene Black, Natalie Demetriou, Andros Zemenides, Yiannis Colakides, Yiannos Economou, Konstantia Sofokleous, Ioakim Mylonas, Diomedis Nikitas, Klitsa Antoniou, Sophia Hadjipapa-Gee, Demetris Rousos, Panayiotis Fotiou, Eva Korae and Monika Herodotou, Nicos Synnos, Elias Demetriou, Adonis Florides. The videos are produced by NeMe and are presented here in low resolution with the permission of the artists. Below is a random selection of videos from the event. Refresh your browser to watch others. We would very much like you to watch these NeMe produced videos uploaded on Vimeo, presenting the works presented in IDEODROME 20116, 2007, 2008 and 2009: Nikos Sinnos and Andros Zemenides, Taxi, Adonis Florides, Pixels, Yiannis Colakides, At the end of the pier, Helene Black and Natalie Demetriou, Carousel, Giorgos Sisamos and Dinos Hadjidemetri, Goodzila, Yannis Yapanis, The order, Nicos Synnos, Trip to the Moon 2, Helene Black, No place like home, Adonis Florides, Eyes, Ioakim Mylonas, Nostalgia, Yiannos Economou, Camera Travels, Konstantia Sofokleous, Cross Stitch Kit, Yiannis Colakides, Letter from Eric, Demetris Rousos, Pause Fast Foward, Panayiotis Fotiou, I can't see myself, Ioakim Mylonas, Code Decode, Diomedis Nikitas, Audio Displacement, Yiannos Economou, Sunday Story, Konstantia Sofokleous, Invisible to everyone, Adonis Florides, Overtime, Demetris Rousos, Reload, Sophia Hadjipapa-Gee, Life is, Klitsa Antoniou, Experimental Storytelling, Nicos Synnos, Dress Quest, Adonis Florides, Do not step on my moon, Elias Demetriou, Denials in the island of love, Eva Korae and Monika Herodotou, An elephant in the room, and Panayiotis Fotiou, Absolutely nothing. Cultural Services of the Cyprus Ministry of Education and Culture, Cyprus University of Technology, Municipality of Limassol.